Bunny has a lot to do before he goes to bed. He splashes through a bubble bath, brushes his teeth, and picks up his toys, saying good night to everything and everyone along the way. Night-night, books. Night-night, bear. Each spread depicts Little Bunny participating in bedtime activities that little ones will find familiar. 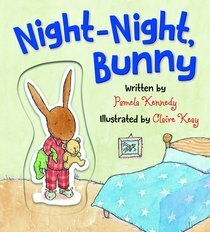 A raised appliqué of Little Bunny peeks through the die-cut cover, inviting children into the story. Endearing illustrations and soothing repetition make this board book a perfect introduction to bedtime routines for even the youngest of children.